Move with our mermaid princess in search of emeralds and we have left abandoned in the depths of this girls game treasures. You have to find all the diamonds are submerged in the sea bottom dodging their malevolent creatures. We have sharks, piranhas and shoal as enemies, do not hit them or you will eat. Can you make all our treasures?. 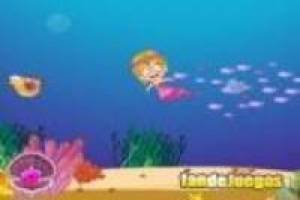 Enjoy the game Mermaid treasure hunt, it's free, it's one of our girls games we've selected.